Bigjigs Rail Pink 123 Engine is designed for young train engineers who love vibrant pink color palettes! This cheery locomotive is traditional in everything but color, and it's supplied complete with a wagon and the '123' marking on the side. The magnetic couplings ensure compabilitity with all the other engines, carriages and freight cars in the Bigjigs Rail collection. The 2-piece set is 5.5'' long. Most other major wooden railway brands are compatible with Bigjigs Rail. Bigjigs products conform to ASTM and CPSIA safety standards. Made from high quality, responsibly sourced materials and suitable for 3+ years. The Bigjigs Rail collection is one of the most complete wooden railway sets available. Our comprehensive collection includes train track, train sets, trains, train tables and more, making Bigjigs Rail the perfect choice when starting or extending a wooden railway network. Founded in June 1985, Bigjigs Toys is a family operated business which has never lost sight of its roots. Our mission is to deliver quality, safe and affordable products, which are responsibly sourced and complement childhood through fun, exploration and learning. We believe that the best toys are powered by creativity and imaginative play and strive to produce toys that are cherished and enjoyed for years to come. Toot toot. This pretty and traditional pink engine has magnetic couplings, so children can easily build a collection of wagons for it to pull along. The ideal first train for a wooden railway system. Girls play with trains too. Established in the UK in 1985 BigJigs Toys is a family business through and through. Over the last 25 years we have grown into an extended family though a team of dedicated staff. After many years developing the range in the UK and Europe we are now delighted to be launching our range into the United States. BigJigs Toys prides itself on providing great quality products combined with a high standard of service and delivery. All products in the US collection are tested to meet ASTM requirements and CPSIA regulations. Consisting of wooden train track, wooden train sets, wooden trains, train tables, accessories and much more our trains are compatible with other leading wooden railway systems. 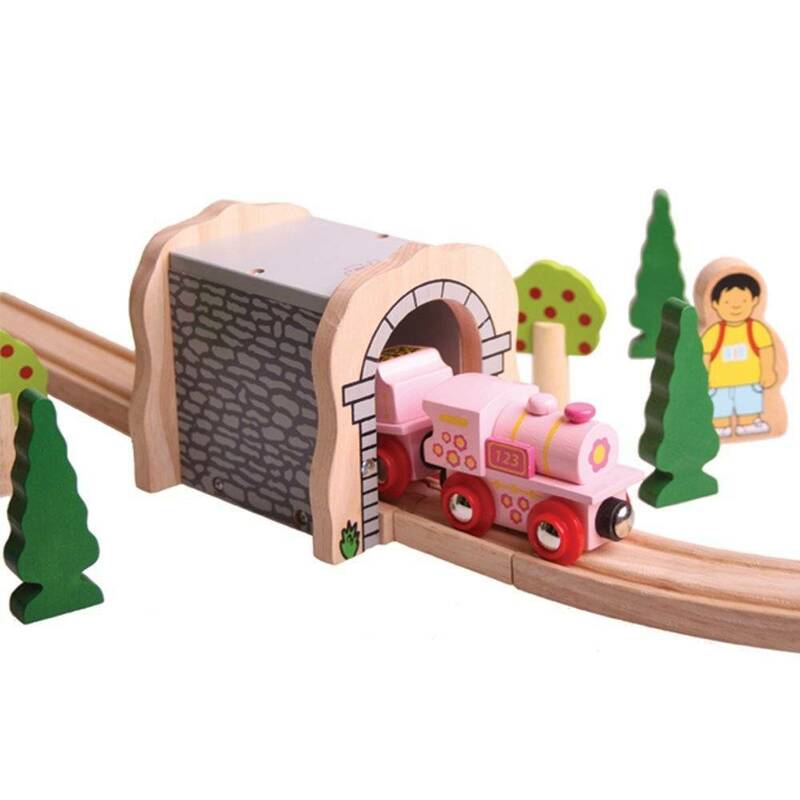 BigJigs Rail is the perfect choice for any Wooden Railway collection.